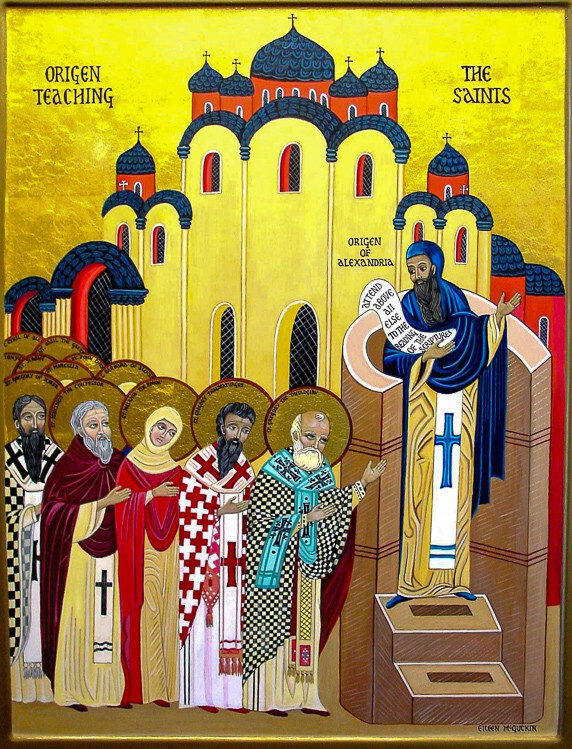 Topic: origen of alexandria: heretic? Is Origen of Alexandria a heretic? My understanding was some of his works were deemed heretical, but that he himself was not anathematized. It would seem strange to anathematize someone whom many Fathers respected. Re: origen of alexandria: heretic? Origen was obviously very influential to Christian theology and spirituality. He was widely admired. For instance, Sts. Basil and Gregory Nazianzen compiled a Philokalia of writings of his that they deemed edifying. The ideas he was condemned for (look for Justinian's anathemas) seem to mainly be some excessive Platonic imports. I'm not sure how clearly he was personally anathematized, but it was certainly taken that way after the Fifth Ecumenical Council by many. For instance, at his trial, when St. Maximus the Confessor was asked if he was an Origenist, he immediately said "Anathema to Origen." It would seem strange to anathematize someone whom many Fathers respected. What about Apollinaris of Laodicea? He taught some wrong things, like universal salvation if I recall or the pre existence of souls. Origen, a truly compassionate & conscientious theologian, was anathematized by the emperor St. Justinian (who burned Manicheans alive left on ships adrift at sea, as noted by author: Harry J Magoulias in: "Byzantine Christianity: Emperor, Church, & the WEst). This is something I recommend just taking an aspirin to relieve a given headache of & not to become bothered by. Also remain an admirer of Origen if you like; I do. Origin was a pretty cool guy. It looks as if OC.net hath spaketh and anathematized the anathema! When did this happen in gold foil, faux or fact? The website of the artist who originally painted it was posted here a few months ago, which had the high def image. I was bummed and glad at the same time. St. Justinian was totally awesome. emperor St. Justinian (who burned Manicheans alive left on ships adrift at sea, as noted by author: Harry J Magoulias in: "Byzantine Christianity: Emperor, Church, & the WEst). Source was probably Procopius's Wars of Justinian. That he ever advanced apthartodocetism is very debatable. This doesn't surprise me... Justinian was an aggressive individual, and his anathema of Origen and univesal reconciliation is very unfortunate, but i don't think its the last word on things (and I don't believe represents the consensus on Christian theology- I myself believe in conditional universalism). Nontheless, I do like his hymns in the eastern liturgy. The former, yes. The latter, well, look at the sort of universalism he specifically condemned. No doctrine of Sola Justinian. And also a surpisingly intellectual individual as well. and his anathema of Origen and univesal reconciliation is very unfortunate, but i don't think its the last word on things (and I don't believe represents the consensus on Christian theology- I myself believe in conditional universalism). Well, the anathema against Origen's apocatastasis wasn't at all unfortunate. St. Gregory of Nyssa had a much more nuanced view of the apocatastasis, and IIRC that one isn't anathematised. It's not like the Church tosses out everything Origen wrote. In fact, the only problematic things, IIRC, are those passages where he expresses his weird philosophy. Other works, however, are often read and are very edifying. Evagrius of Pontus was also anathematized by the Fifth Ecumenical Council, and his works are even more widely read in the Church. They are solid works on prayer and spiritual life. It was not the Emperor St. Justinian who anathematized, but the Holy Church. If it were only the emperor himself, and he had no authority to do this personally, but even if by force of personality he was able to bend a council to his will, other emperors have done the same thing and their designs have been consigned to the dustbin. The Church cannot be manipulated. Emperors are not all-powerful nor are they immortal. It is really worth actually getting to know St. Justinian (and the other "controversial" saints, before one slaps a big fat condemnation on oneself by speaking ill of them out of ignorance). I actually do like Justinian, but I'm not sure how he is a saint on par with Origen. Ah, the wonderful different meanings interpretation gives to words. You are aware that Origen is not on the Eastern Orthodox, Roman Catholic, Oriental Orthodox, or Assyrian Calendars? Last I checked, he wasn't commemorated by the Anglicans/Episcopalians, either, at least not since 1979. Emperor Justinian built a huge church! he is a saint! do not mind the nika riots... ! In my reading of Origen, I see some platonic influence just as I see it in almost all of the people of the time period. I wonder if his followers perhaps took his views further and that was what led to his condemnation? Gregory of Nyssa also taught some form of apocatastasis, as does (at least in my reading of the Orthodox Church) Metropolitan Kallistos Ware. It is quite obvious that many of the Church Fathers are not considered infallible, and Origen doesn't seem that far out when I read him.